When the target's HP is above 50%, Rehabilitate heals the ally by (50% User's ATK - 10). If the result number is too low by falling under 7, then it will instead heal a flat 7 HP instead. 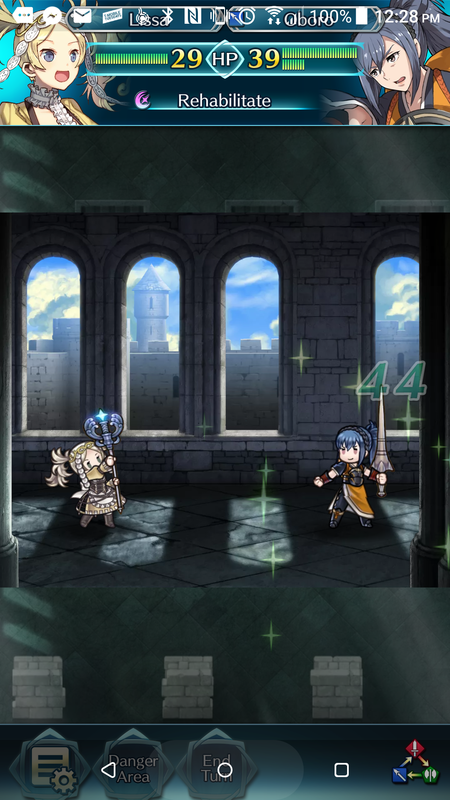 For example, if a healer has 50 ATK in battle, then the healer will restore 15 HP to the ally, a better amount compared to the default. Another example would be if a healer has 25 ATK in battle, then the healer will restore 5 HP to an ally; Since the lowest amount of healing one can do is 7, the 5 is bumped up to 7 instead. When the target's HP is below 50%, Rehabilitate heals (50% of User's ATK - 10, minimum of 7) HP + (2 x (50% of Target Maximum HP - Target current HP)). This can result in situations where the amount of HP restored to the target far exceeds their maximum health. Due to the formula, a target with (50% of Healer's ATK -10, minimum of 7) HP or less will always be healed to his or her HP maximum, regardless of what that HP maximum is. This page was last edited on 11 April 2019, at 04:34.